For other uses, see Dunhuang (disambiguation). Dunhuang ( listen (help·info)) is a county-level city in northwestern Gansu Province, Western China. The 2000 Chinese census reported a population of 187,578 in this city. Dunhuang was a major stop on the ancient Silk Road and is best known for the nearby Mogao Caves. It has also been known at times as Shazhou and, in Uyghur, Dukhan. Dunhuang is situated in a oasis containing Crescent Lake and Mingsha Shan (鸣沙山, meaning "Singing-Sand Mountain"), named after the sound of the wind whipping off the dunes, the singing sand phenomenon. Dunhuang commands a strategic position at the crossroads of the ancient Southern Silk Route and the main road leading from India via Lhasa to Mongolia and Southern Siberia, as well as controlling the entrance to the narrow Hexi Corridor, which led straight to the heart of the north Chinese plains and the ancient capitals of Chang'an (today known as Xi'an) and Luoyang. The ruins of a Han Dynasty (202 BC - 220 AD) Chinese watchtower made of rammed earth at Dunhuang. There is evidence of habitation in the area as early as 2,000 BC, possibly by people recorded as the Qiang in Chinese history. Its name was also mentioned in relation to the homeland of the Yuezhi in the Records of the Grand Historian. Some have argued that this may refer to the unrelated toponym Dunhong – the archaeologist Lin Meicun has also suggested that Dunhuan may be a Chinese name for the Tukhara, a people widely believed to be a Central Asian offshoot of the Yuezhi. By the third century BC, the area became dominated by the Xiongnu, but came under Chinese rule during the Han dynasty after Emperor Wu defeated the Xiongnu in 121 BC. Dunhuang was one of the four frontier garrison towns (along with Jiuquan, Zhangye and Wuwei) established by the Emperor Wu after the defeat of the Xiongnu, and the Chinese built fortifications at Dunhuang and sent settlers there. The name Dunhuang, meaning "Blazing Beacon", refers to the beacons lit to warn of attacks by marauding nomadic tribes. Dunhuang Commandery was probably established shortly after 104 BC. Located in the western end of the Hexi Corridor near the historic junction of the Northern and Southern Silk Roads, Dunhuang was a town of military importance. "The Great Wall was extended to Dunhuang, and a line of fortified beacon towers stretched westwards into the desert. By the second century AD Dunhuang had a population of more than 76,000 and was a key supply base for caravans that passed through the city: those setting out for the arduous trek across the desert loaded up with water and food supplies, and others arriving from the west gratefully looked upon the mirage-like sight of Dunhuang's walls, which signified safety and comfort. Dunhuang prospered on the heavy flow of traffic. The first Buddhist caves in the Dunhuang area were hewn in 353." During the Sui (581-618) and Tang (618-907) dynasties, it was the main stop of communication between ancient China and the rest of the world and a major hub of commerce of the Silk Road. Dunhuang was the intersection city of all three main silk routes(north, central, south) during this time. From the West also came early Buddhist monks who had arrived in China by the first century AD, and a sizable Buddhist community eventually developed in Dunhuang. The caves carved out by the monks, originally used for meditation, developed into a place of worship and pilgrimage called the Mogao Caves or "Caves of a Thousand Buddhas." A number of Christian, Jewish, and Manichaean artifacts have also been found in the caves (see for example Jingjiao Documents), testimony to the wide variety of people who made their way along the Silk Road. During the time of the Sixteen Kingdoms, Li Gao established the Western Liang here in 400 AD. In 405 the capital of the Western Liang was moved from Dunhuang to Jiuquan. In 421 the Western Liang was conquered by the Northern Liang. As a frontier town, Dunhuang was fought over and occupied at various times by non-Han people. After the fall of Han Dynasty it came under the rule of various nomadic tribes, such as the Xiongnu during Northern Liang and the Turkic Tuoba during Northern Wei. 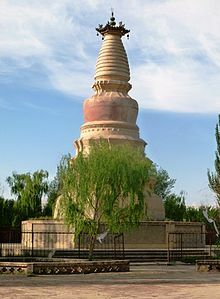 The Tibetans occupied Dunhuang when the Tang empire became weakened considerably after the An Lushan Rebellion; and even though it was later returned to Tang rule, it was under quasi-autonomous rule by the local general Zhang Yichao who expelled the Tibetans in 848. After the fall of Tang, Zhang's family formed the Kingdom of Golden Mountain in 910, but in 911 it came under the influence of the Uighurs. The Zhangs were succeeded by the Cao family who formed alliances with the Uighurs and the Kingdom of Khotan. During the Song dynasty, Dunhuang fell outside the Chinese borders. In 1036 the Tanguts who founded the Western Xia dynasty captured Dunhuang. From the reconquest of 848 to about 1036 (i.e. era of the Guiyi Circuit), Dunhuang was a multicultural entrepot that contained one of the largest ethnic Sogdian communities in China following the An Lushan Rebellion. The Sogdians were Sinified to some extent and were bilingual in Chinese and Sogdian, and wrote their documents in Chinese characters but written horizontally from left to right instead of the right to left vertical lines that Chinese was normally written at the time. Dunhuang was conquered in 1227 by the Mongols who sacked and destroyed the town, and the rebuilt town became part of the Mongol Empire in the wake of Kublai Khan' s conquest of China under the Yuan dynasty. Dunhuang went into a steep decline after the Chinese trade with the outside world became dominated by Southern sea-routes, and the Silk Road was officially abandoned during the Ming dynasty. It was occupied again by the Tibetans c. 1516, and also came under the influence of the Chagatai Khanate in the early sixteenth century. It was retaken by China two centuries later c. 1715 during the Qing dynasty, and the present-day city of Dunhuang was established east of the ruined old city in 1725. 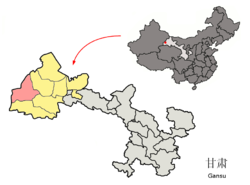 In 1988, Dunhuang was elevated from county to county-level city status. Today, the site is an important tourist attraction and the subject of an ongoing archaeological project. A large number of manuscripts and artifacts retrieved at Dunhuang have been digitized and made publicly available via the International Dunhuang Project. The expansion of the Kumtag Desert, which is resulting from long-standing overgrazing of surrounding lands, has reached the edges of the city. In 2011 satellite images showing huge structures in the desert near Dunhuang surfaced online and caused a brief media stir. A number of Buddhist cave sites are located in the Dunhuang area, the most important of these is the Mogao Caves which is located 25 km (16 mi) southeast of Dunhuang. There are 735 caves in Mogao, and the caves in Mogao are particularly noted for their Buddhist art, as well as the hoard of manuscripts, the Dunhuang manuscripts, found hidden in a sealed-up cave. Many of these caves were covered with murals and contain many Buddhist statues. Discoveries continue to be found in the caves, including excerpts from a Christian Bible dating to the Yuan Dynasty. Numerous smaller Buddhist cave sites are located in the region, including the Western Thousand Buddha Caves, the Eastern Thousands Buddha Caves, and the Five Temple site. The Yulin Caves are located further east in Guazhou County. The Yumen Pass, built in 111 BC, located 90 km (56 mi) northwest of Dunhuang in the Gobi desert. These rammed earth ruins of a granary in Hecang Fortress (Chinese: 河仓城；; pinyin: Hécāngchéng), located about 11 km (6.8 mi) northeast of the Western-Han-era Yumen Pass, were built during the Western Han (202 BC - 9 AD) and significantly rebuilt during the Western Jin (280-316 AD). Dunhuang Night Market is a night market held on the main thoroughfare, Dong Dajie, in the city centre of Dunhuang, popular with tourists during the summer months. Many souvenir items are sold, including such typical items as jade, jewelry, scrolls, hangings, small sculptures, leather shows puppets, coins, Tibetan horns and Buddha statues. A sizable number of members of China's ethnic minorities engage in business at these markets. A Central Asian dessert or sweet is also sold, consisting of a large, sweet confection made with nuts and dried fruit, sliced into the portion desired by the customer. Dunhuang has a cold desert climate (Köppen BWk), with an annual total precipitation of 67 millimetres (2.64 in), the majority of which occurs in summer; precipitation occurs only in trace amounts and quickly evaporates. Winters are long and cold, with a 24-hour average temperature of −8.3 °C (17.1 °F) in January, while summers are hot, with a July average of 24.6 °C (76.3 °F); the annual mean is 9.48 °C (49.1 °F). The diurnal temperature variation averages 16.1 °C (29.0 °F) annually. With monthly percent possible sunshine ranging from 69% in March to 82% in October, the city receives 3,258 hours of bright sunshine annually, making it one of the sunniest nationwide. A railway branch known as the Dunhuang Railway (敦煌铁路) or the Liudun Railway (柳敦铁路), constructed in 2004-2006, connects Dunhuang with the Liugou Station on the Lanzhou-Xinjiang railway (in Guazhou County). There is regular passenger service on the line, with overnight trains from Dunhuang to Lanzhou and Xi'an. Dunhuang Station is located northeast of town, near the airport. There are plans to extend the railway from Dunhuang further south into Qinghai, connecting Dunhuang to Yinmaxia (near Golmud) on the Qingzang railway. Construction work on this Golmud–Dunhuang railway started in October 2012, and is expected to be completed in 5 years. The Singing Sand Dunes on the eastern edge of the Kumtag Desert near Dunhuang. Sculpture in Dunhuang, after a mural in Mogao Caves, depicting an Apsara playing the pipa behind her back (Chinese: 反弹琵琶伎乐天). Mogao Caves, a.k.a. Dunhuang Grottoes. ^ a b Cable and French (1943), p. 41. ^ Skrine (1926), p. 117. ^ Lovell (2006), pp. 74-75. ^ Lin Meicun (1998 ), The Western Regions of the Han–Tang Dynasties and the Chinese Civilization [Chinese language only], Beijing, Wenwu Chubanshe, pp. 64–67. ^ Hill (2015), Vol. I, pp. 137-140. ^ Bonavia (2004), p. 162. ^ a b "Dunhuang Studies - Chronology and History". Silkroad Foundation. Archived from the original on 2016-03-03. Retrieved 2019-01-04. ^ Galambos, Imre (2015), "She Association Circulars from Dunhuang", in Antje Richter, A History of Chinese Letters and Epistolary Culture, Brill: Leiden, Boston, pp 853-77. ^ "The International Dunhuang Project". International Dunhuang Project. Archived from the original on 2011-07-20. Retrieved 29 July 2011. ^ "Ancient Chinese town on front lines of desertification battle, AFP, Nov 20, 2007". ^ Wolchover, Natalie (16 November 2011). "Odd patterns in Chinese desert? Spy satellite targets.". MSNBC. Archived from the original on 19 November 2011. ^ China. Eye Witness Travel Guides. p. 494. ^ "Dunhuang Climate − Best time to visit". Retrieved 2009-12-06. Bonavia, Judy (2004): The Silk Road From Xi'an to Kashgar. Judy Bonavia – revised by Christoph Baumer. 2004. Odyssey Publications. Cable, Mildred and Francesca French (1943): The Gobi Desert. London. Landsborough Publications. Galambos, Imre (2015), "She Association Circulars from Dunhuang", in Antje Richter, A History of Chinese Letters and Epistolary Culture, Brill: Leiden, Boston, pp 853–77. Legge, James. Trans. and ed. 1886. A Record of Buddhistic Kingdoms: being an account by the Chinese monk Fâ-hsien of his travels in India and Ceylon (AD 399-414) in search of the Buddhist Books of Discipline. Reprint: Dover Publications, New York. 1965. Lok, Wai-ying. (2012). The significance of Dunhuang iconography from the perspective of Buddhist philosophy: a study mainly based on Cave 45 (PDF) (PhD Dissertation). The University of Hong Kong. Lovell, Julia (2006). The Great Wall : China against the World. 1000 BC — AD 2000. Atlantic Books, London. ISBN 978-1-84354-215-5. Skrine, C. P. (1926). Chinese Central Asia. Methuen, London. Reprint: Barnes & Noble, New York. 1971. ISBN 0-416-60750-0. Watters, Thomas (1904–1905). On Yuan Chwang's Travels in India. London. Royal Asiatic Society. Reprint: 1973. Wikimedia Commons has media related to Dunhuang. Wikivoyage has a travel guide for Dunhuang.